Having fun, unique favors to send home with guests is probably half the fun, and stress, of a party. 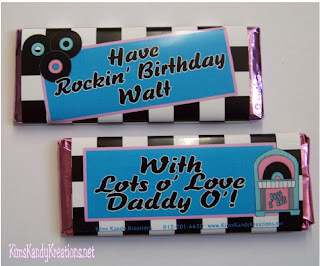 Today's post is going to be some ideas of favors for yours Fifties Sock Hop theme. If you remember, I shared the highlights of Busy Me, Busy with Three's Sock Hop birthday party HERE where she made Cd's for each of the guests with fifties music on it. Then, she covered the CD with a sticker that looked like a record. Very clever. At my daughter's Rocking Birthday party that I apparently never blogged about, we made these records for each of the girls to take home. We simply spray painted a record gold. Then at the start of the party, I took a picture of all the girls together. I printed it out and xyroned it into a sticker. Then each of the girls signed them and they all took one home. Make a bag of Old Fashioned candy from the 1950s and give to each guest. 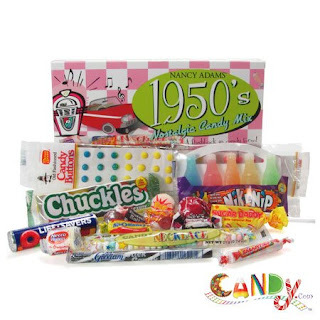 A few candies that are still around include: Jr. Mints, Fireballs, Bit-o-Honey, Bottle Caps, Candy Buttons, Candy Necklaces, Dots, Dubble Bubble, Fun Dip, Gobstoppers, Good & Plenty, Lemon Heads, Necco, Pixy Stix, Razzles, Pop Rocks, Root Beer Barrels, Sweet Tarts, Tootsie Rolls, and Zots. What about sending each of the kids home with vintage toys? Give each one their own Hoola Hoop or Frisbee or even a set of Paper Dolls. I think we are going to have Paper Dolls at our party, and it was difficult to find some good sets around the web, so here are a few places that have old fashioned printable paper doll sets. 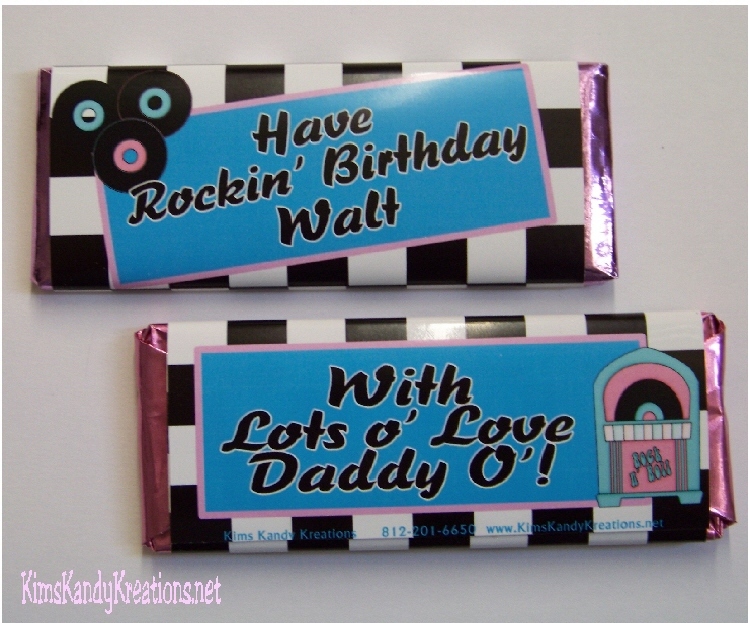 How about sending each guest with a candy bar personalized to your party theme and special guests? We are going to do this for our party favors. 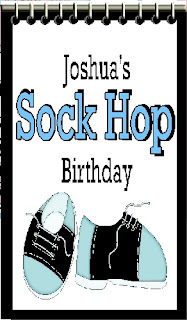 (Warning: party store plug) You can check out lots of different Sock Hop party favors from our Home Store including notebooks, lollipops, chocolate suckers, candy bars, and more. What a great party idea! 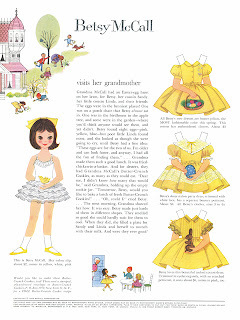 Love the concept of sending the kids home with Betsy McCall paperdolls too! Thank you for swinging by my blog and for your kind comments!